As with all windows and doors, there are a variety of composite doors on the market and they can vary greatly in their product and manufacturing quality. They can also vary in terms of material composition. Some can have solid wood cores and others may have insulating foam with or with out wood. The paint finish can also differ from manufacturer to manufacturer. In general, Composite doors have increased strength and a much higher thermal insulation than wooden doors, because of their insulating foam centre. They also have the added benefit of appearing to look like a wooden door due to the wood grain finish that is available. Therefore, if you want to get away from the white plastic front door look it is a much more authentic choice in order to create a more traditional looking home – especially for a period property. 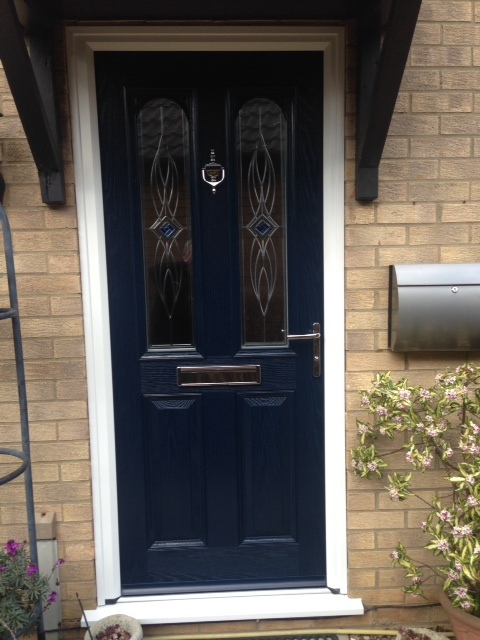 A composite door also allows the option of a single door rebate or a twin/double rebate. The double rebate door is sturdier so is a suitable option for the door that gets the most frequent use. It also gives a higher level of draught proofing and damp prevention, making the double rebate door ideal for residential properties and especially homes that are designed with the front door opening directly into a main room such as the lounge. As with any PVC door you have optional door furniture choice (handles, letter boxes, knockers, numbers). Also a choice of locking systems and threshold height and material options. Unlike wooden doors the only maintenance required is to wipe a composite door over with a damp cloth if they get dirty. So no more sanding, painting and varnishing wood!